Written by: Shannon Pratt-Phillips, PhD. 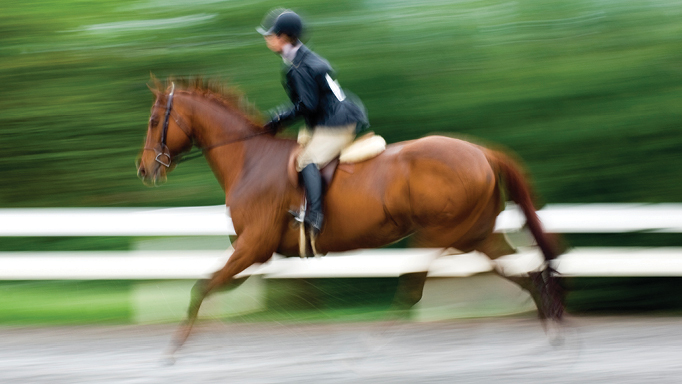 Make sure your horse gets the protein he needs by providing essential amino acids in his diet. Amino acids are the building blocks of protein, which contribute to most of the horse’s vital processes. Different combinations of amino acids form a variety of proteins, which the horse can use in different ways. In this article, we will explain how they work in the body, and how you can ensure your horse is getting the protein he needs. 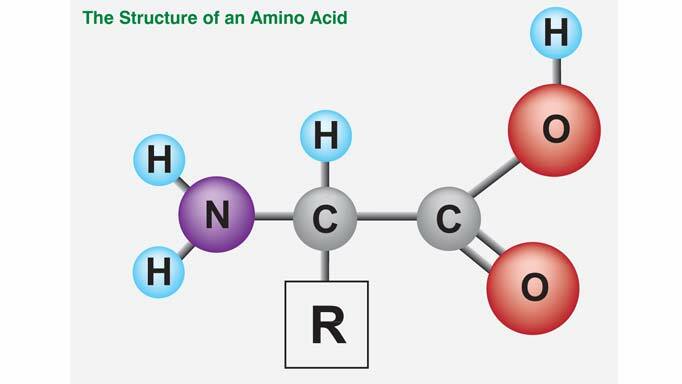 Amino acids differ from other organic compounds (namely fats and carbohydrates, which contain only oxygen, carbon and hydrogen) because they also include an “amine” group in their structure. The amine group is unique because it contains the element nitrogen. There are approximately 20 different primary amino acids, all of which are made up of amine and carboxylic acid groups of molecules, but differ from each other in that they each have a unique side-chain (represented as “R” in the illustration). These side-chains vary in structure, from a single hydrogen atom (as found in the amino acid glycine), to more complex and even cyclic structures (such as the amino acid tyrosine). These side-chains usually contain carbon, oxygen and hydrogen atoms, but some contain additional nitrogen atoms (such as the amino acid lysine), or sulfur atoms (as found in the amino acids methionine and cysteine). When joined together in a chain, amino acids form proteins and “peptides.” Shorter peptides are chains of 50 amino acids or less. Longer proteins have upwards of 27,000 amino acids. One can consider amino acids as letters of the alphabet, with proteins being words. Similar to letters forming a variety of words of different lengths with different letters, proteins are made of different combinations of the amino acids. 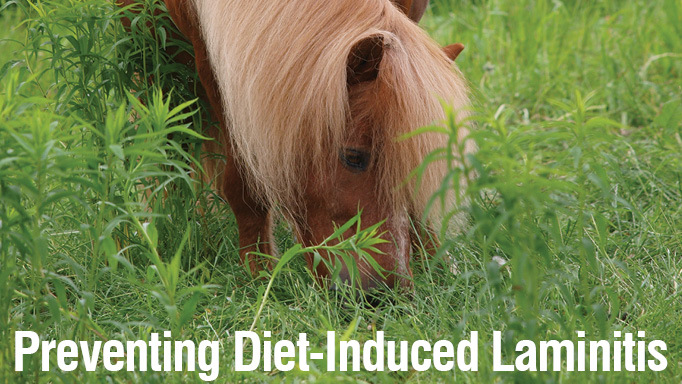 From a dietary standpoint, horses ingest whole protein compounds found in various foods. Proteins are too large, however, to be absorbed directly into the bloodstream. Thus, proteins are digested and broken down into the individual amino acids through the actions of hydrochloric acid in the stomach and various enzymes in the stomach and small intestine. The individual amino acids are absorbed into the bloodstream and can then be used to build different proteins for the body (structural elements such as collagen, or hormones such as insulin, for example), to synthesize other large molecules such as DNA, or the amino acids can be broken down further and metabolized to provide energy. Nutritionally, it is the individual amino acids provided for in the diet that are important. This is because the body needs these amino acids as ingredients to build proteins. The body actually has the ability to synthesize some of the amino acids itself. These are not, therefore, specifically required in the diet, and are thus termed “non-essential” amino acids. Those amino acids that the body cannot synthesize (or at least not in sufficient amounts) must be provided for in the diet, and are considered “essential amino acids.” There are 10 amino acids that are considered essential for the horse: arginine, histidine, isoleucine, leucine, lysine, methionine, phenylalanine, threonine, tryptophan and valine. A “limiting” amino acid is an essential amino acid that is often found in less than adequate amounts in feeds. All protein synthesis by the body will be limited, therefore, to the amount of that amino acid provided. Lysine is considered the first limiting amino acid, because it is required in relatively large amounts, and is not found in adequate levels in many foods. An analogy would be to consider lysine as the letter “E”. Many words would not be able to be made if “E” weren’t available. Similarly, protein synthesis would be limited if lysine were not available in the diet. Threonine is likely the second limiting amino acid, closely followed by methionine and tryptophan. to provide a nitrogen source for non-essential amino acid synthesis. Little information is available though, regarding individual amino acid needs of horses. In fact, lysine is the only amino acid for which there is a specific daily requirement. This differs greatly from other species, such as swine, where there is a concept of “ideal protein,” wherein the protein in the dietary ration is formulated to meet the needs of the animal for all of the essential amino acids. Nonetheless, research is ongoing to identify the individual amino acids needs of horses. Most commercially available feeds are formulated to meet the lysine requirements of horses, and are formulated with ingredients that provide a wide range of the key essential amino acids. When formulating a diet for horses, we need to consider both protein quantity and protein quality. In terms of protein quantity, the horse needs a certain number of grams of protein per day and, of this, a certain amount (grams) of lysine needs to be provided. Good quality protein sources are those feedstuffs that provide ample lysine, plus other essential amino acids. Equine feedstuffs vary greatly in their protein content and in their amino acid profiles. Plants differ in their ability to synthesize amino acids, resulting in some differences we see among plant-derived proteins. Legumes, such as alfalfa (alfalfa hay) and soybeans (as found in soybean meal) have a unique symbiotic relationship with Rhizobia bacteria, which allows them to take up ample quantities of nitrogen from the soil, and, as such, they have a greater ability to produce amino acids, and protein in general, than other plants (such as grasses and grains). As a result, feeds such as alfalfa hay have higher amounts of protein than grass hays (such as timothy or orchardgrass), and soybeans (and the more common equine feed, soybean meal, which is the residual meal after the oil has been extracted) have more protein than oats or corn. Soybean meal and other seed meals (linseed meal, cottonseed meal for example) are excellent sources of lysine and some other essential amino acids. Other excellent sources of protein include animal derived proteins such as casein (dried milk protein) or fishmeal. In conclusion, when formulating your horse’s diet, remember that you are not really providing your horse with protein, but rather a source of amino acids for them to build their own protein. 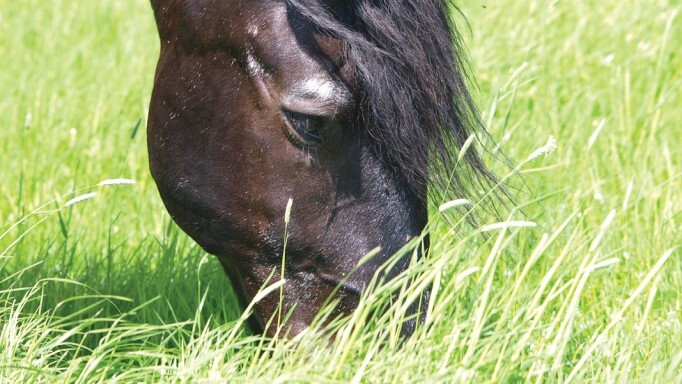 It is important to be aware of feeds that are high in the essential amino acids, and to incorporate those into the diets for your horses, particularly those who are growing, as they will have more protein to synthesize. 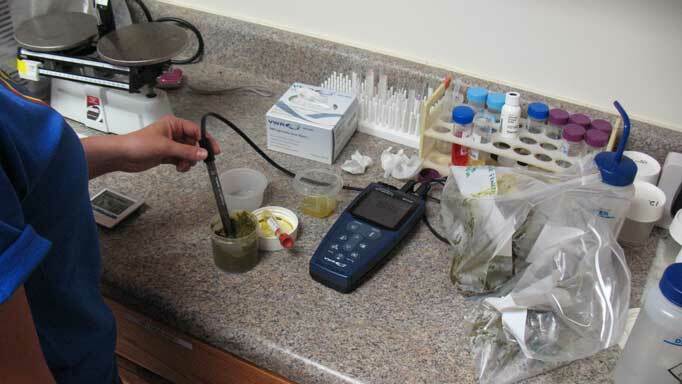 Always be sure to work with an equine nutritionist to help formulate your horse’s diets to meet their needs. It is interesting to note the difference in essential amino acid requirements of horses, compared to ruminants such as cattle. Ruminants have billions of microbial organisms in their foregut (rumen), which have the ability to produce microbial protein (and all of the amino acids) if they are provided with a nitrogen source. When feed continues through their digestive tract to their small intestine, these microbial proteins can be broken down, and the resulting amino acids are released and absorbed. Ruminants, therefore, do not have a similar need for essential amino acids as horses (or humans) do, because the microbes can provide them. Horses also have microbial organisms that produce microbial protein – but, the difference is that the population of microbes is in the large intestine, which is after the small intestine, where the protein-breaking enzymes are located. Thus, while it is possible there is some amino acid absorption from the large intestine, most microbial protein produced by microbes in the large intestine of the horse winds up in the feces. Learn the correct way to collect a manure sample. Get advice on feeding calming supplements from equine nutritionist Shannon Pratt-Phillips, Ph.D.